Shaking, breathlessness, feeling out of control—if you’ve experienced any of these, you may have been in the throes of a panic attack. Our modern lifestyles are packed with stressful situations that many of us struggle to cope with. Panic attacks are severe reactions to stress and anxiety characterized by a rapid onset of intense and overwhelming physical symptoms. They often occur randomly with no obvious trigger. But more distressing still, you can even experience panic attacks at night. Chances are, if you experience panic attacks during the day, you’ll also experience them at night. Nocturnal panic attacks happen while you are asleep, waking you abruptly and causing fear and confusion. You may feel helpless to stop them happening, because, unlike daytime attacks, you can’t see them coming. While panic attacks are a product of your mind, they cause very real physical symptoms. In fact, some of these are so severe and difficult to cope with that you might feel as though you’re having a heart attack. According to Mental Health Charity Mind, panic attacks last between 5 and 20 minutes, and symptoms usually peak within 10 minutes. Usually, you’ll only experience one or a few of these symptoms during an attack, but because they are frightening in themselves, the anxiety they trigger can cause the symptoms to worsen. Why Do Panic Attacks at Night Happen? Anxious childhood—If you grew up in an environment where you weren’t taught how to deal with stress, or if you had parents who were anxious or overprotective, you are more likely to experience panic attacks. Genetic predisposition—Some people are genetically more likely to develop panic attacks. Response to big life events—Periods of high stress or major life changes such as changing jobs, getting married or divorced, bereavement or loss, moving, trouble at work, exams and becoming a parent can have a cumulative anxiolytic effect and cause panic attacks. According to Anxiety Coach, most people who develop panic attacks do so in their 20s and 30s, which is the time when most of us establish an independent life. Obstructive Sleep Apnea—This is when the walls of the upper airway relax and narrow during sleep, affecting normal breathing. Many people with this condition will wake up and fall asleep again without noticing, but it can cause some to wake up in total panic. Acid Reflux Disease—The symptoms of this condition are similar to more serious illnesses and include night sweats, chest pain or pressure and difficulty breathing. The anxiety and stress caused by severe acid reflux disease can lead to nocturnal panic attacks. It doesn’t take long for nocturnal panic attacks to begin affecting your entire life. If you’re regularly waking up in the middle of the night, you’re at risk of suffering from sleep deprivation. Chronic lack of sleep can affect your body in many ways, including weakening your immune system, impairing your memory and making you feel moody. These, in turn, can negatively impact your life, affecting your work and your relationships. One thing to be mindful of is that panic attacks at night are caused by things that are beyond your control. Please do not feel guilty or ashamed. Let’s take a look at how you can overcome these panic attacks, free yourself from their grip, and enjoy a good night’s rest. Deep breathing—Slow, deliberate, deep breaths are a great way to center yourself again. Breathe in through your nose, and exhale through your mouth, focusing on the sensation of the air flowing in and out of your body. Take a look at our article for more anxiety breathing exercises. You can also keep soothing essential oils by your bed, like lavender and chamomile, which will help to relax you. Progressive muscle relaxation—Tense up and relax each part of your body in turn. Begin with your toes, and work your way up your body to your head. Visualizing a place where you feel completely comfortable and at ease can make this exercise even more effective. Panic sheet—Write up a panic sheet, and keep it by your bed. When a nocturnal panic attack wakes you up, grab the sheet and read it to remind yourself of what you’re dealing with. Include things like, “This is a panic attack,” “Take slow, deep breaths,” and other soothing phrases that are meaningful to you. If you feel very awake and energized, don’t fight it—get up and do something menial, like tidying, sorting through a bookshelf, or tackling those big cleaning chores you may have been putting off. You’ll soon find your body wants to fall asleep again. Don’t switch on the TV or go on the computer as the blue light from these devices will delay your sleep. If you think acid reflux or obstructive sleep apnea may be an issue, speak to your doctor about available treatments. A healthy diet; avoiding fatty, greasy, overly spicy, processed foods and alcohol; and exercise can also help manage these conditions. Try not to get stuck on the “why.” Many people go round and round in circles wondering why this is happening, but this question can lead to guilt and increased stress and anxiety. Instead, focus on being mindful and present and getting yourself back to a place of calm. With gentle attention, you can soothe yourself back to sleep. 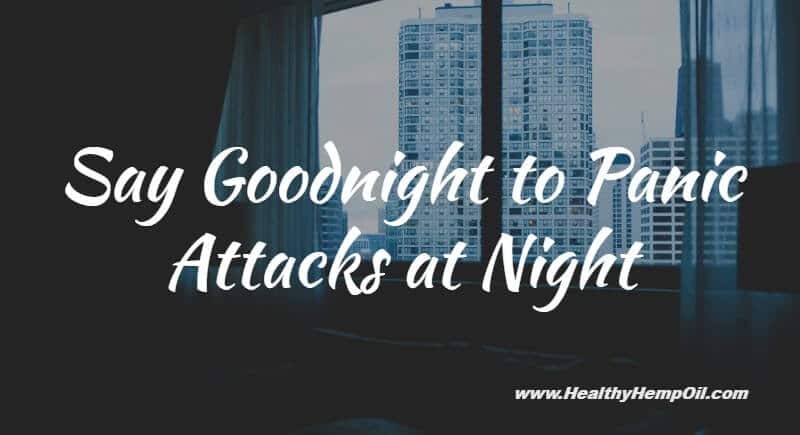 Have you struggled with panic attacks at night? What are some of the symptoms you experience? How do you get back to sleep? Do you have any tips you’d like to share? We’d love to hear from you, so please write us a note in the comments.